PopChar has been around since almost the beginning of the Mac. Ergonis Software has done a swell job for frequent font users, and now had PopChar X 5.2, a new version for finding and inserting special characters. PopChar X 5.2 focuses on metrics and font size. The most prominent change is a new slider at the bottom of the PopChar window that allows you to customize the display size of individual fonts in addition to the global setting in PopChar's preferences. The new slider is ideal for fonts with small and light characters that you want to appear in a larger size. 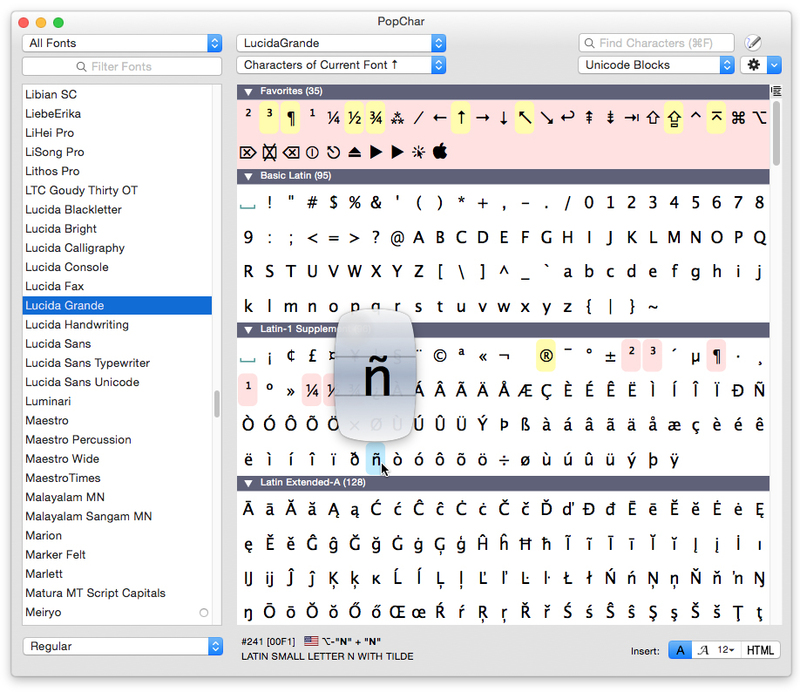 PopChar 5.2 also contains fine-tuned adjustments for many popular fonts. The program "knows" about 70+ fonts with unusual metrics and avoids large white areas around characters, which results in larger characters that are easier to read. Beyond that, PopChar 5.2 solves some known issues and reduces the CPU load when running in the background. PopChar solves a problem faced by every technologist and multi-lingual worker. Inserting special characters into application documents can be frustrating and results in a steady loss of productivity. With PopChar, thousands of special characters are only a few clicks away. Just pop up the PopChar window, click the desired character, and the character appears in your current document right away. Ergonis Software's website to learn more about specific enhancements contained in this release and to download a trial copy. PopChar X 5.2 requires Mac OS X version 10.4 or newer. Mac OS X 10.6 or newer is recommended. PopChar X 5.2 is a recommended update for everyone running on Mac OS X 10.6 (Snow Leopard). PopChar can be purchased securely on the Ergonis Software website. The upgrade to PopChar X 5.2 is free for anyone who purchased PopChar X in the last 2 years. For information about purchases, including family and enterprise licenses, volume discounts, and upgrade pricing offers, visit the company's website. Instead of purchasing PopChar by itself, customers can get the Macility Productivity Bundle that also contains two of the company's other productivity tools, KeyCue and Typinator. Headquartered in Hagenberg, Austria, Ergonis Software Gmbh is a privately held software development company founded in 2002. With a focus on innovation, Ergonis develops ergonomic and intuitive software that boosts the productivity of Mac and PC users alike. Copyright 2002-2011 Ergonis Software Gmbh. All Rights Reserved. Ergonis products are either registered trademarks or trademarks of Ergonis Software GmbH. Other company and product names may be trademarks of their respective owners.